Tickets have been selling fast for the ACC bouts in November. The tribe has been coming together to help out our fighters in a big way. All fighters are ahead of schedule as far as their weight is concerned. They are starting to understand and implement their game plans during sparring sessions as well. November is looking to be very positive for our MMA fighters. The Next ICC (Instructor Certification Course) begins on November 25th at Jungle Gym New Roc. Three Saturday’s in a Row at 9am. See the Front Desk for more info and to Sign Up! Parents Night Out was a blast! There were some pretty awesome costumes this year, we had a Great White Shark walking around the mats. The night was packed with fun games and included an epic dance battle. As per usual, the kids enjoyed some pizza and a movie to cap off the night. Check with us at the front desk for details and the date for next months Parents Night Out. 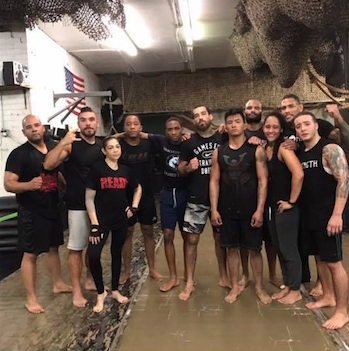 Lions of Leadership Open Mat is Every Sunday at HQ and this Month on November 25th at Jungle Gym New Rochelle. These are great training sessions so do your best to be there. We had a strong conditioning class this past weekend with a few of our teens. Taking care of your strength and conditioning can be a huge benefit to your Jiu Jitsu game, contrary to what you’ll here a lot in the Jiu Jitsu community, that strength doesn’t matter. We certainly want our skill training to be the priority, but having a couple days a week where you are making your body stronger will only help. Your coaches at the Jungle Gym are well educated in what kind o protocols you should be following so feel to ask. Also our new Jungle Tough T-shirt is up for pre order. Order by October 30th and get it for just $20. Dedication! Today I want to you think back on all the hard times you’ve been through during your journey to that healthier life style. What’s been keeping you going? Where is that fire that’s keeping you going coming from? How can you stay so dedicated and committed to this mission? Maybe it’s a dream you have, some inspirational words you read, or just a special person who keeps pushing you forward. Whatever it is, today I want you to find that thing, and nurture it, make it stronger and thank it for doing the same for you. As always I will see each and every one of you in the gym. Let’s make it happen! With a few fighters stepping in the cage soon the tribe is bringing as much energy to these grueling sessions as possible. Together we the tribe is stronger.